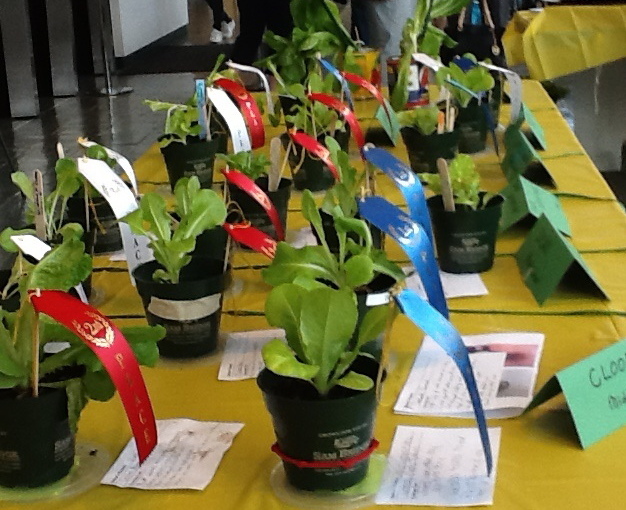 Lettuce Challenge - 78 entries from 53 classes or clubs in 19 different schools - K-12. The variety of sizes and shapes and color from the same buttercrunch lettuce plugs speaks to the differences in care and in conditions: amount of water, misting or direct pour, compactness of soil, degree of light exposure, closeness of light source to plant, grow lights vs sunny windows, temperature in rooms, daily tending or weekly.... Much to take away from this experience. The objective is to produce the best-formed head of lettuce in 6 weeks. Bottom line: we must share "best practices" so that the quality of the product improves while the process remains fun and exciting. The starter lettuce plugs are about 3/4 inch tall in 1/2 inch thimble-like plastic containers. The end product is in a 4" in diameter pot and ranges from 3" to 10" tall, with 2" to 8" spread. The judges look for compact growth and healthy green leaves forming into a head. However, all will end up in the school vegetable gardens to continue growing until they are salad-ready. They're not finished yet. YUM!